Sydney Reddick is also remembered on Page 23 of the Central Council for Church Bellringers Roll of Honour (image of original page) and its online version; and on Ashtead’s War Memorials. See also his Lives profile. This page sets out the key events of his life, with detailed references. See the bottom of the page for automatically generated links to blog posts which refer to this page. SurreyParish1: Marriage of Arthur Reddeck [sic] and Eliza Partridge, 13 November [sic] 1888, Leatherhead. Although the month of the marriage has been transcribed as November, it is incomplete on the image, and the height of the ascender visible suggests the month is actually October, particularly when compared with the previous page of the register where there is another October marriage recorded. had to remain in TF units. The London Regiment was an all TF unit, and many of its battalions were affiliated to the Royal Fusiliers (aka the City of London Regiment). In order to maintain his TF status, this batch of men were put on the books of 1st (City of London) Battalion, the London Regiment (Royal Fusiliers) for records purposes, but saw active service only with 26th Battalion, Royal Fusiliers. CWGC1: Casualty details – Reddick, Percy, the Commonwealth War Graves Commission. 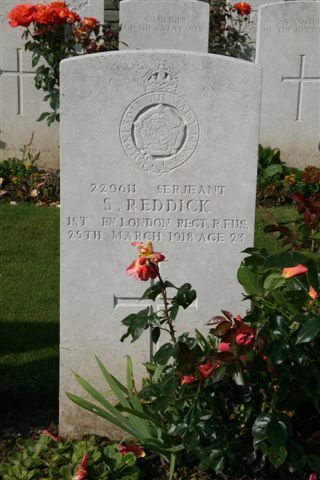 CWGC2: Casualty details – Reddick, Sydney, the Commonwealth War Graves Commission.